Classes focus on the ABC's of being a Ninja: Agility, Balance, Coordination, and Swinging. Each week, we teach new obstacles and ninja skills! Classes are recommended for kids between the ages of 6 and 12. Level I classes are offered in three age groups: Ages 6-8 and 9-12. Classes are for one hour and meet once per week. We also offer preschool ninja classes for ages 3-5! FOR MORE INFORMATION SEE BELOW! 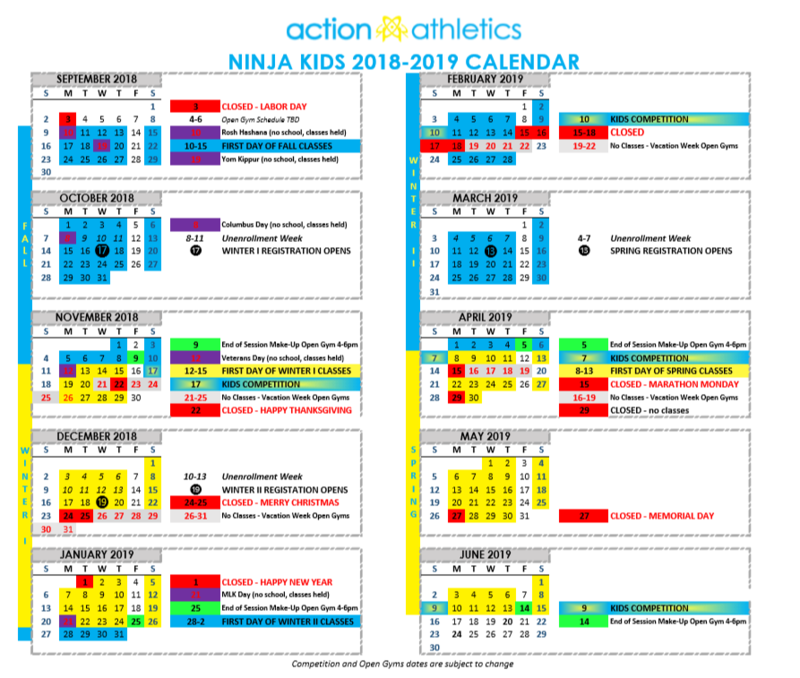 Ninja Kids Class Information, Schedule, Competitions, and Calendar! Online registration is closed, but it is not too late to register for the Spring Session! Contact us at info@action-athletics.com and let us know if you're interested or have any questions. Registration will close on Thursday, April 18th. No make-up classes will be issued. If you are unable to attend a class, and you inform us prior to the missed class, we will issue you an open gym pass to be used in any of our age appropriate open gyms. Open Gym Schedules can be found here! Or this make up pass can be used at our end of session "Make-Up Open Gym" (see below for date). All of our coaches will be in Baltimore for the filming of ANW Season 11! We apologize for cancelling classes, but if you register for a Monday class this Spring, you will receive a $50 account credit. The end of session "Make-Up Open Gym" is on Friday, June 14th from 4:00-6:00. This open gym will be an instructed open gym, open to only those with an open gym pass from missing a class in the Winter I Session. This Open Gym is not applicable for Preschool Ninjas. (with the exception of vacation weeks). Cost is $400 per session. Once you enroll in a class, your spot is automatically confirmed for all remaining sessions! However, if you do not wish to continue, you are allowed to "un-enroll" during our un-enrollment week. Any spots that open up will be available to the public the following week. Our classes are now further divided by ages for Level I. We will be running four Kids Competitions throughout the year that are open to everyone! Competition registration fee may apply. We will no longer have an end of session competitions. A full-year calendar is posted below! Calendar includes closed dates, registration dates, and competition dates. Everything you need to know for the year. Join our email list to stay up to date on information about all of our classes.